Let’s face, sometimes it’s just not worth it to drag out the 70 pound compressor from your garage for a quick light duty job. If you plan on doing a lot of work indoors or don’t think you’ll need a unit other than to inflate tires and toys, trim work, airbrushing, or blowing off dust, you’ll most likely be much better of with a small, lightweight (~20 lbs) unit that easy to use and move around by pretty much anyone. This compact Bostitch unit has a 1.2 gallon tank, weighs only 24 pounds, yet puts out almost 3 CFM of airflow at 90 PSI with its 2 horsepower motor. 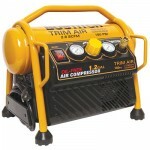 That put it in the company of larger and heavier compressors but without their bulk and more expensive price tag. The CAP1512-OF is super easy to move around and its tank fills up quickly so you can start on your project right away. Perfect from filling up bicycle tires to building that new deck in your backyard. While the Bostitch is the most powerful model out of this group, it’s also the noisiest. 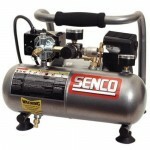 The Senco is an excellent light duty air compressor that weighs in at only 20 pounds. It’s very popular for hobbies and crafts although it has no problems inflating a car tire (although a bit slower than more powerful units) or installing crown molding. The PC1010 is one of the lightest compressors you’ll find and also one of the quietest. 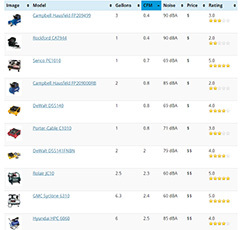 For such an inexpensive unit, owners seem to be very satisfied with the build quality and durability of this model. Specs wise, the DeWalt D55140 is very similar to the Senco above but is four pounds heavier. The biggest difference is the shape. Both have a hot dog shaped air tank but the DeWalt sits a bit flatter while the Senco has a slightly more upright shape and smaller footprint. 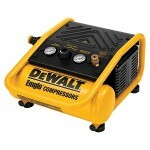 DeWalt is a better known brand and generally makes high quality products. The only problem with this unit is that a few users have experienced the internal fuse blowing. According to DeWalt, this is most likely due to too long of an extension cord being used. If this problem didn’t exist, the D55140 would be giving the Bostitch above, a run for its money.